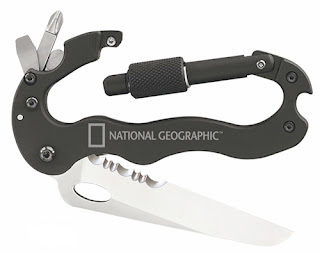 This is a mix between a carabiner and a knife with some multi-tool elements dropped into the mixture. The Kershaw five in one is a 4.125'' (10.4cm) carabiner featuring a knife, a phillips screwdriver, a flat screwdriver and a bottle opener. The carabiner is made of anodized aluminium and has a screwdown safetylatch. It is unsuitable for climbing but can be used attached to a belt, backpack, vest or many other items. The total weight of the tool is 2.7oz. The knife is made of AUS6A Stainless Steel and is 3.25'' (8.1cm) long when opened. It has partial serrations and a small thumbhole to assist the opening.Once opened the knife locks using a liner-lock mechanism. Both the carabiner and the knife are good tools but are certainly not in the top quality section of either knives or carabiners, the screwdrivers and bottle opener are also ok. It is not each tool but the combination of all the elements what makes this multitool interesting. If you use carabiners frequently to attach different gear to your backpack or vest you can certainly consider this. One interesting advantage is that being in a carabiner shape that can be clipped to many things makes the tools very handy for quick use in case of need. You can get this tool for $39 from KnifeCenter or read more information visiting Kershaw's website. A long time ago artists used to use silver pointed pencils to create some beautiful drawings. This pen while not using silver is based on the same principle. The Pen is made of stainless steel with a solid metal compound tip, there is no ball, no ink, nothing just plain metal at the tip. When writing the pressure of the pen over the paper will leave microscopic traces of the metal on the paper producing the writing. 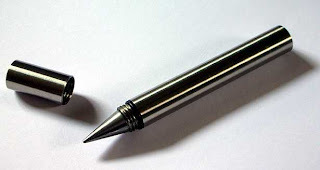 Since there is no ink the pen will never dry and the tip will write for a very long time before the metal is consumed. You can leave the pen for years get it back and it will work in the same way it works today. The metal alloy employed for the tip writes on almost any paper surface and produces a good writing as long as you remember this pen is not for writing the story of your life but more a backup or a novelty pen. The absence of ink makes the pen an all-weather and conditions instrument and the solid stainless steel body works well as a kubotan. You can read more and order for $30 from grand illusions. Another source for about $25 here.